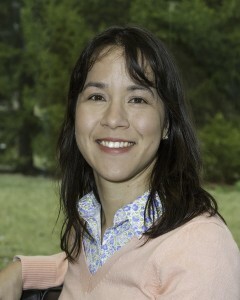 Marie Snipes is an assistant professor in the Mathematics and Statistics Department at Kenyon College, working on geometric analysis. A mathematician! I study the geometry of metric spaces and maps between metric spaces (e.g., embeddings of metric spaces into Euclidean space). What brought you to IPAM? I was excited about the long program of Interactions between Analysis and Geometry because of the wide range of participants (from graduate students to top researchers) in areas related to geometric analysis. In particular, one of the other fields of mathematics that I’ve been hoping to merge into my research is probability, and there were a number of invited speakers and participants that had a lot of expertise in the sort of stochastic metric space analysis that I want to get more involved in. Wendelin Werner’s lecture series was also a big draw. I was very interested in hearing about his perspectives. There was also a series of lectures by Steffan Rohde on stochastic Loewner evolution (SLE). He gave these as a graduate course, but it became part of the IPAM long program and he actually gave his lectures at IPAM. A number of us from the long program participated in his whole course. SLE is a model for a lot of different random curves, and this is an area that I had really been hoping to learn more about. IPAM was a great place to start a lot of probabilistic conversations with people. How did the IPAM program help you in your research? At IPAM I felt like I had time to actually pursue topics that came up during the long program’s four conferences and have ongoing conversations with the other participants that would have been much more difficult over email during a typical semester. The IPAM program also turned out to be an opportunity for me to meet up with my collaborator Lesley Ward, who is now at the University of South Australia. She came to one of the workshops, Analysis on Metric Spaces, and we took that opportunity to have a reunion with other collaborators who had originally started working with us as REU students. applications to computer science. For example, datasets can often be thought of as metric spaces and you can imagine that it would be useful to know when you can think of your dataset as living in some low-dimensional Euclidean space. My favorite paper (that I’ve written) is Flat forms in Banach spaces in large part because of its connection to metric space embeddings. In the paper I developed the notion of a “flat differential form” for Banach spaces and proved a duality result that provides a particular theory of integration in that setting. It is pretty abstract, but the duality result — a version of what’s known in geometric measure theory as “Wolfe’s Theorem” — has potential applications to the metric space embedding problem that I find fascinating!